For 39 years in over 350 features and some 33 serials, the lean, nasty, sneering presence of George Chesebro menaced cowboy stars from silent days on through the demise of the B-westerns in 1954. Chesebro’s hatchet faced badmen knew no boundaries, they were at every studio—Columbia, Republic, Universal, Monogram, PRC down to the lowliest independents. Chesebro plied his vile plots in as many as 26 films a year in the ‘30s, averaging 15-20 per year through the ‘40s. 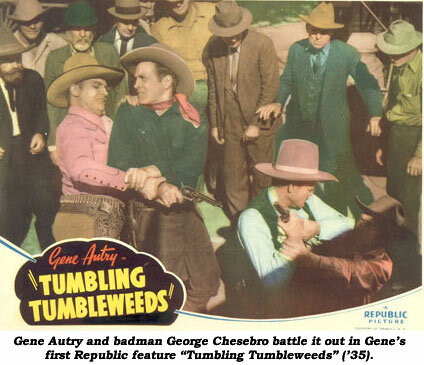 There is hardly a western star you can name that didn’t feel the wrath of George Chesebro in the talkies from ‘31-‘54. Born July 29, 1888, in Minneapolis, MN, he started his acting career in a local stock company in 1907. Vaudeville was next, touring the Orient with a musical comedy group from 1911-1913. He came to Hollywood in 1915 and found work in a Universal two-reeler, “Money To Burn”. Within a year he had the lead in a Dudley-Unity independent western, “The Land Just Over Yonder”. For the next few years he played male leads opposite popular female performers—Olive Thomas (in “Broadway, Arizona” ‘17); Texas Guinan (in “Girl of Hell’s Agony” ‘18 and “She Wolf” ‘19); Ruth Roland (“Hands Up” serial ‘18). During the making of “Hands Up” for Pathe, George entered the U.S. Army for service in WWI and was replaced for the remainder of the production by George Larkin. Upon his discharge, he continued as a leading man in serials opposite Eileen Sedgwick in “Diamond Queen” (‘21), “Lost City” (‘20) and “Hope Diamond Mystery” (‘21). In 1921-‘22 Chesebro began an association with actor-director-producer Milburn Morante which resulted in George starring in a series of six independent Northwest Mounted Police dramas (“Hate Trail”, “The Recoil”, etc.). “Wolf Blood” (which survives on video today) was George’s last starring vehicle, a logging camp story which he also helped direct. 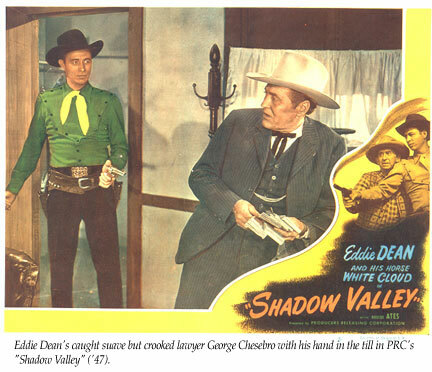 Shifting to villainous character roles, he imperiled silent stars Art Acord, Neal Hart and Bob Curwood, thereby setting the pattern for the rest of his career, rustling cattle, bushwhacking sheriffs, manhandling ladies and plotting all manner of land grabs. He was so associated with loathsome villains that in Roy Rogers’ “Trail of Robin Hood” (‘50) perhaps the biggest “inside” joke in B-westerns occurred. As Roy rounds up all his B-western star-friends to help get the wagon loads of Christmas trees to market, up rides George, willing to help, extending his hand in friendship, but Tom Keene, Rocky Lane, Tom Tyler and the others give him the cold shoulder. Young Carol Nugent exclaims, “I know you! You’re always the meanie!” After George explains he’s reformed, Roy and the other cowboy heroes warmly welcome Chesebro into their group. An engaging moment unlike no other in B-western history, and one devout B-western devotees still remember fondly today. Chesebro capped a 39 year film career with an unbilled part in “Boy From Oklahoma” with Will Rogers Jr. in 1954. The end of the trail came for George in L.A. on May 28, 1959.